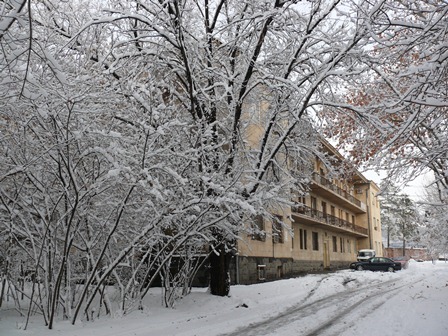 The Yerevan Physics Institute (YerPhI now renamed as A. Alikhanyan National Labaratory as A. Alikhanyan National Labaratory Foundation ) was founded in 1943 as a branch of the Yerevan State University by brothers, Abraham Alikhanov and Artem Alikhanian. Later two high-altitude Cosmic Ray Stations were founded on Mount Aragats. Among the key results of AANL in the early years were the discovery of protons and neutrons in cosmic rays, and the establishment of the first evidence of existence of the particles with masses between that of muons and protons. The high altitude research stations have remained the main research base of the Cosmic Ray Division (CRD) of YerPhI until now. Among the CRD achievements there were: discovery of sharp knee in light components of primary cosmic rays, detection of the highest energy protons accelerated on the Sun, and the creation of the Aragats Space environ­mental Center in 2000 for studies of the solar-terrestrial connection, where CRD becomes one of the world’s leaders. The 6 GeV electron synchrotron was accom­plished in 1967; the results obtained on meson photoproduction by unique beam of polarized gamma-quanta, inves­ti­gations on roentgen transition radiation, which is well-known among the scientific community. The traditional topic of YerPhI is the development of new particle detectors. Wide spark chambers and transition radiation detectors are examples of the experimental techniques developed and implemented in YerPhI. During the last years groups of scientists from Yerevan Physics Institute have actively participated in medium and high energy physics experiments abroad (JLAB, DESY, CERN), exploring the meson and nucleon structures, electromagnetic interactions of the nucleon, quark-hadron duality, short range nucleon-nucleon correlations, quark hadronization in nuclear medium, quark-gluon plasma, and many other topics, as well as in construction of experimental hardware and development of the software for data acquisition and analysis. After establishing the A. Alikhanyan National laboratory Armenian physicists continued work in the fields of high energy physics and astrophysics in Armenia and world biggest accelerators. In 2011 the cooperation agreements were signed with DESY and Jlab. CRD is a world leader in the surface monitoring of the secondary cosmic rays along with major geophysical parameters. Numerous particle detectors measuring charged and neutral fluxes are operating at 3 levels (800, 2000 and 3200 above sea level) and provide the scientific community with unique data. Strong electrical fields inside thunderclouds give rise to the enhanced fluxes of high- energy electrons and, consequently, gamma rays and neutrons. During thunderstorms at Mt. Aragats, hundreds of the Thunderstorm Ground Enhancements (TGEs) comprising of millions of additional particles were detected at Aragats Space Environmental Center (ASEC) on altitude of 3200 m. Observed large TGE events allow for the first time to measure the energy spectra of electrons and gamma rays well above the cosmic ray background. The integral energy spectra of the electrons have exponential shape and extend up to ~40 MeV. The recovered power-type gamma ray energy spectra prolonged up to 100 MeV. At lowest recovered energies (∼2-3 MeV) the intensity of gamma rays over-performed cosmic ray background ~1000 times, thus proving existence of the Runaway Breakdown (RB, now referred as Relativistic runaway electron avalanche RREA) process in the thunderstorm atmospheres. CRD flagships development of the Space Environmental Viewing and Analysis Network (SEVAN) a worldwide network of identical particle detectors located at middle and low latitudes aimed to improve fundamental research of space weather conditions and to provide short- and long-term forecasts of the dangerous consequences of space storms. SEVAN detected changing fluxes of different species of secondary cosmic rays at different altitudes and latitudes, thus turning SEVAN into a powerful integrated device used to explore solar modulation effects. Experiment GAMMA located at Mt. Aragats continue studying of the main characteristics of the very-high energy cosmic rays and gamma-rays. Of particular interest is the phenomenon observed for the first time with the GAMMA experiment in 2008 – the strong irregularity in the all-particle energy spectrum at energies of about 70 PeV. To prove of this phenomenon is extremely important from the point of view of very-high energy astrophysics. Well-known scientists from USA, France, Russia, Germany, Switzerland, Poland are involved in the GAMMA Collaboration.